The Brighton Wheel is set to be replaced by two 300m zipwires, dubbed the Brighton Zip, once the ferris ride is taken down in May – and the new attraction is set to be hanging around for a lot longer. 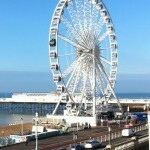 Councillors are set to approve a zip wire attraction to replace the Brighton Wheel on the seafront at a meeting next Thursday – and if they do, the operators hope to get it up in time for this summer. 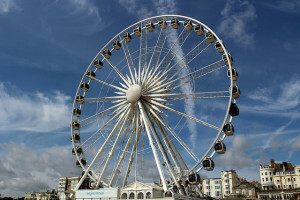 When the Wheel was a set up in 2011, operators Paramount Entertainment agreed to remove it in time for the opening of the 180-metre i360 viewing tower just along the beach. The Wheel’s planning consent expires at the end of May, with the i360 due to open this summer. An attempt to renew planning consent was turned down last year. Paramount have now applied to replace the Wheel with two 300m-long zip wires, with thrill-seekers whizzing down a cable from a 20m tower where the wheel now stands to a landing area on the beach. A jump zone would also feature, where people could leap 20m to a safe landing area. A new café also forms part of the plan, which the council report says will bring £1.7m private investment to the city. The report also recommends it obtain public liability insurance for £10m. Laura Dyson from Brighton Wheel said: “We are very excited about our new attraction the Brighton Zip to replace the wheel. It will give Madeira Drive a great boost and act as a catalyst for regeneration East of the Pier. Council leader and committee chair Warren Morgan said: “We always remained interested in the idea of another attraction to replace the Wheel. Now we have a proposal with much less visual impact for the neighbours. Madeira Drive trader Neil Sykes, who has been active in calling for the area east of the pier to be regenerated, said he thought the zip wire could be good for neighbouring businesses. He said: “When the council refused the wheel an extension, they stated it did not attract enough clients, which was a weak reason. Trading year-round, the Brighton Zip would be the largest such ride in Sussex and represent a £1.7m investment. Operators hope to open in time for this summer. A report to the council’s economic development and culture committee on March 10 recommends granting landlords’ consent at the Dalton’s Bastion site, just east of Brighton Pier. Like the Wheel, proposals would also need planning permission, plus consent to use what is currently designated as part of the highway. If approved the attraction is likely to get a 25 year lease. At 300m, the wire will be longer than the 250m pier to beach zipwire which opened on Bournemouth Pier in 2014 – a helmetcam video showing what it’s like to ride that is below. Sort out Madeira Drive first. A cable car between the seafront and Woodingdean has to be the way forward. I look forward to the day I can get the cable car to the seafront and then hop on the monorail to the shops.